An exceptional trio: three courthouses from different periods straddle the street. 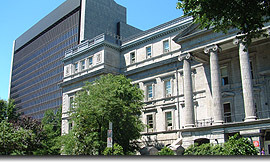 The "Old Courthouse", inaugurated in 1856, is a good example of neo-classical architecture. Work on its dome started in 1890. One floor has also been added. Since 1971, all legal business has been conducted in the modern facilities, including civil marriages. But the balcony of the Old Courthouse remains the preferred spot for wedding photos! Credits. All rights reserved, 1998-2001.